Tomb of Philip found at Hierapolis? Italian professor Francesco D’Andria announced the discovery of the tomb of the Apostle Philip at Hierapolis. See more, with a photo, here. The structure at Hierapolis known as the Martyrium of Philip dates to the 5th century A.D. It is located in the distance above the theater. The Martyrium of Philip is in the distance beyond the theater. Photo by F. Jenkins. Early tradition associates Philip with the city, but scholars differ over whether it was Philip the apostle (Matthew 10:3) or Philip the evangelist (Acts 21:8). The brief reports of the discovery by Prof. D’Andria does not provide enough information for us to be able to draw a conclusion. The question of which Philip is addressed by Mark Wilson in Biblical Turkey and Fant and Reddish in A Guide to Biblical Sites in Greece and Turkey. I will leave it for the moment. This new discovery will more likely reflect the 5th century Byzantine tradition about Philip. Hierapolis is mentioned only once in the New Testament, as one of the cities of the Lycus River Valley. Hierapolis is also known as the home of Papias (about A.D. 60 to 130) who was a disciple of the apostle John and a companion of Polycarp. Fragments of his writings about the apostles survive in Irenaeus and Eusebius. 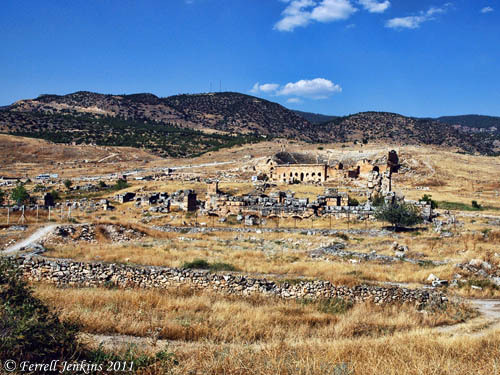 We have commented on Hierapolis several times over the years. See here. Use the Search box to locate the other posts if you have additional interest in the city. This entry was posted in Archaeology, Bible Places, Bible Study, New Testament, Photography, Travel, Turkey and tagged Apostle Philip, Hierapolis, Philip the Evangelist. Bookmark the permalink. Greetings to you from Istanbul. I hope you are in good spirits. Hasn’t the time for you to come to Turkey again come yet?